So you've already run at least one marathon (26.2 miles), and now you're moving on to your next goal: improving your time. Use this 18-week training schedule to help you run a personal record (PR) in your next marathon. To start this plan, you should already be running about 30 to 60 minutes a day, about five days a week and can run up to 6 miles comfortably. If you're not up to that, try the ​advanced beginner marathon schedule. 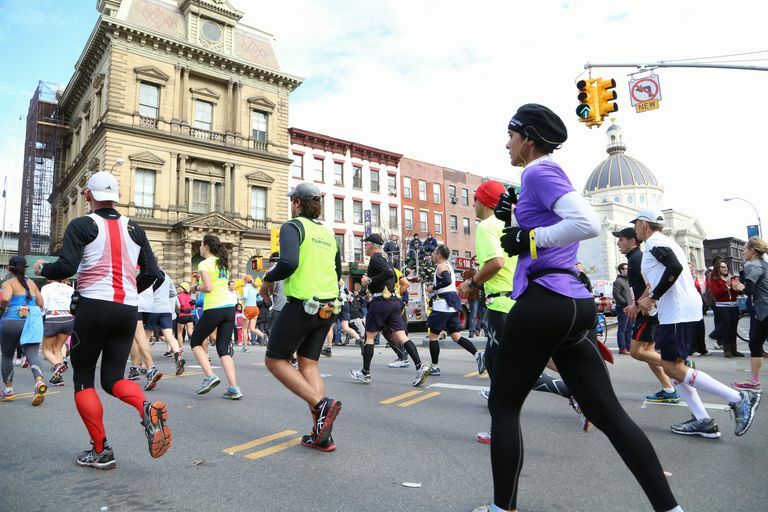 If this schedule seems too easy, try the ​advanced marathon schedule. Cross-training (CT): Cross-training activities allow you to give your joints and running muscles a break, while still working on your cardio. When the schedule calls for CT, do a cardio activity other than running (biking, swimming, elliptical trainer) at moderate effort for 45 to 60 minutes. Tempo Run: Tempo runs help you develop your anaerobic threshold, which is critical for faster racing. For a 40-minute tempo run, for example, start your run with 5 to 10 minutes of easy running, then continue with 15 to 20 minutes of running at about a 10K pace. Finish with 5 to 10 minutes of cooling down. If you're not sure what your 10K pace is, run at a pace that feels "comfortably hard." Strength-train: After a 10-minute warm-up, spend about 20-25 minutes doing lower body and core strengthening. Interval workouts (IW): After a warm-up, run 400 meters (one lap around most tracks) hard, then recover by jogging or walking 400 meters. For example, 3 x 400 would be three hard 400s, with a 400 m recovery in between. Easy pace (EP): These runs should be done at an easy, comfortable pace. You should be able to breathe and talk easily. Race Pace (RP): After you run a 10-minute warm-up, run the designated mileage at your "marathon Race Pace" (RP). Follow that with a 10-minute cool-down. If you're not sure what your marathon race pace is, add 30-45 seconds per mile to your half-marathon pace. You can also use a recent race time to figure out what your estimated marathon race time would be. Rest: Rest is critical to your recovery and injury prevention efforts, so don't ignore rest days. Your muscles actually build and repair themselves during your rest days. If you run every day without taking days off, you won't see much improvement. Fridays are a good day for rest, as you'll have run on Thursday and will have your longest run of the week on Saturday. Saturday long runs: After you warm up, run at a comfortable, conversational pace for the designated mileage. Make sure you cool down and stretch after your run. If most of your runs are on the road, and you're not sure how far you run, you can figure out the mileage by using resources such as MapMyRun.com. Or, you can always drive your route in your car ahead of time and measure the mileage using your car odometer. Sundays: This is an active recovery day. Your run should be at your comfortable, easy pace (EP), which helps loosen up your muscles. Note: You can switch days to accommodate your schedule. If you're busy one day, it's fine to swap a rest day for a run day. 18 CT 4 mi RP Rest 4 mi EP Rest 2 mi EP Race! Another option to consider for improving your marathon time is to do Yasso 800s. This is a popular workout among runners who are trying to achieve a specific marathon goal.